The headlines were reasonably encouraging, and understandably so. After a pretty miserable February in terms of net payroll growth, March's job growth was relatively strong. And, the figure could have been even better were most of the country not already working a job they liked well enough to keep. Beyond the headlines though, last month's employment snapshot could have been considerably stronger. A couple of dents and dings really stand out. But, first things first. In March, the U.S. added 196,000 new payrolls, well up from the February lull to 33.000. 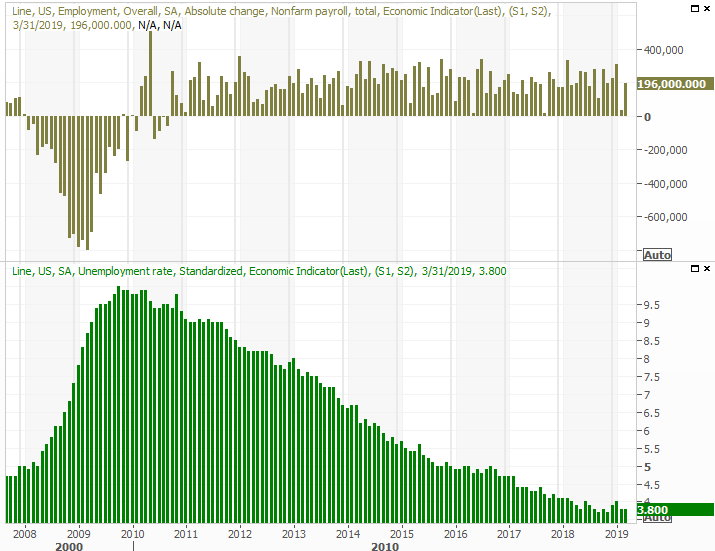 That's still the second-lowest payroll growth figure seen since September of last year, however, and wasn't enough to push the unemployment rate below February's level of 3.8%. Nevertheless, an unemployment rate of 3.8% isn't too shabby. It approaches (and in some cases surpasses) what some economists believe is structurally possible. There are plenty of other red flags though. Chief among them is the fact that the total number of people working as of last month fell from 156.95 million to 156.75 million. The number of officially unemployed people rolled in at 6.21 million, slightly lower than the 6.23 million number from February. 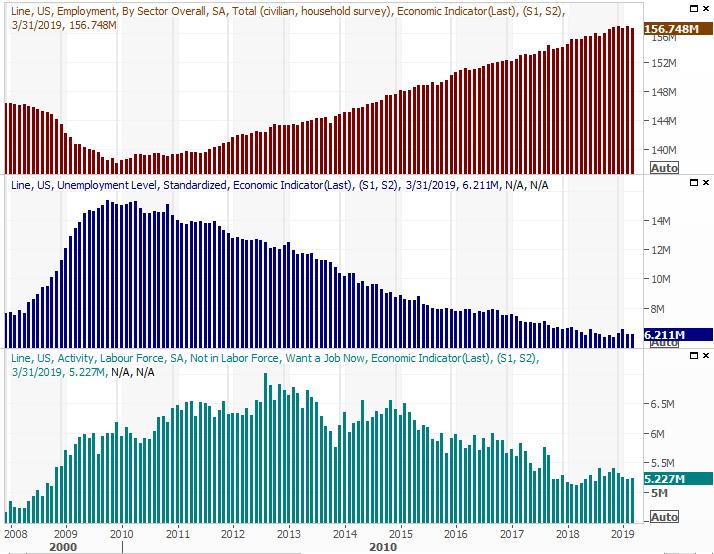 And, the count of people not officially in the labor force but still desiring a job (without actually looking for one) was 5.23 million, up from February's 5.22 million. Ideally, both of those latter numbers would still be shrinking, while the total figure of employed individuals would rise. One off month isn't a call for panic. But, a careful look at the past several months indicates stagnation of all three data points. The even-bigger red flag: The labor force participation rate as well as the employed/population ratio both slumped last month. The employment/population ration fell from 60.7% to 60.6%, and the labor force participation rate tumbled from 63.2% to 60.0%... a sizeable setback that calls into question the rise of the figure seen over the prior five months. It's not devastating, but it is eyebrow-raising. The brightest spot of recent employment reports continues to be the brightest spot... wages. A year-long growth streak was extended another month, with private nonfarm hourly pay growing 3.2% year-over-year. All production and supervisory wages were up 3.3% year-over-year. Yet, the number of hours worked weren't reduced to accommodate larger paychecks. It's possible some of the roadblocks are seasonal, or even weather-related. It's also noteworthy that the U.S. population has shrunk a couple of times in recent months. Still, a smaller populous wouldn't excuse shrinking participation rates, nor the slight uptick in unemployment levels. That said, there's a huge detail in the payroll growth report that arguably does explain most of last month's red flags. Despite his attempts to bolster the nation's manufacturing industries, the manufacturing trade culled 6000 jobs last month. Meanwhile, the retail trade lost 12,000 jobs as the so-called 'retail apocalypse' lingers on. Almost all other types of employers saw respectable growth in the number of positions created and filled. The kind of jobs available, and kind of economy we have, is starting to make a real difference in the jobs picture. On balance, March's jobs report has to get a B-, or maybe even a C+, in school-grade parlance. The superficial data looked pretty good, but the employment ratios should most definitely be moving in the other direction given the underlying dynamics. There's a reason they're not, though it's difficult to fully identify exactly why.